When MGM made a program western, it generally looked more expensive than an entire years' sagebrusher output at Monogram or PRC. 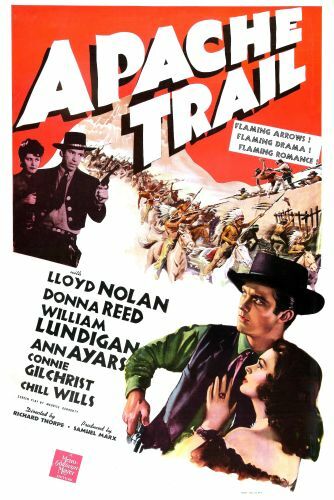 MGM's Apache Trail stars Lloyd Nolan and William Lundigan as two brothers; Nolan is a bellicose highwayman, Lundigan a genial chap assigned guard duties. The main thrust of the film involves an Apache uprising triggered by the theft of a peace pipe. American-as-Cherry-Pie Donna Reed (who plays Lundigan's paramour) is herein cast as "Rosalia Martinez"! Based on a story by Ernest (Stagecoach) Haycox, Apache Trail was remade as Apache War Smoke.